Mallard at Wheatacre Hall Barns in Wheatacre, near Beccles, Norfolk sleeps 7 people. Wheatacre Hall Barns near Beccles are a delightful cluster of restored, semi-detached barn conversions, nestled in the beautiful countryside of south Norfolk. All the barns have been sympathetically converted into contemporary accommodation and are uniquely located on a working dairy and arable farm, in the beautiful, peaceful and rural Waveney Valley. The area adjoins the southern tip of the Norfolk Broads National Park yet is also close to the wonderful historic city of Norwich. Each barn has access to the fitness suite, soft play area, games room and wonderful, relaxing shared hot tub on site. Guests can walk and explore the surrounding area including the extensive river frontage and low laying marshland. A network of walks surround the farm and the beautiful landscape is teeming with wildlife, birdlife and nature. On request guests can be taken on a tour of the milking parlour and the chicken unit. Coarse fishing is available along the River Waveney (licence required). The beach is 13 miles from Wheatacre Hall Barns near Beccles. With the shop 1½ miles, and the pub & restaurant are ½ mile from Wheatacre Hall Barns. Mallard (ref UKC2655), Teal (ref UKC2656 [Teal]), Snipe (ref UKC2657 [Snipe]), Partridge (ref UKC2658 [Partridge]), Coot (ref UKC2659 [Coot]), Widgeon (ref UKC2660 [Widgeon]), Woodcock (ref UKC2661 [Woodcock]) and Pheasant (ref UKC2662 [Pheasant]) can be booked together to sleep up to 41 people. Living area: With 36 Freeview TV, DVD player, iPod dock, CD player and French doors. All properties: Gas central heating, gas, electricity, bed linen, towels and Wi-Fi included. Cot, highchair and stairgate available on request. Welcome pack. External games room with pool table, table tennis, air hockey and table football, indoor soft play area, and gym with cardio fitness equipment, open 6am-10pm (shared with other properties on-site). Small enclosed garden with patio, garden furniture and barbecue. 1,100 acre natural grounds (shared with other properties on-site). Hot tub for 6, open 6am-10pm (shared with other properties on-site). Bike hire available free of charge. Bike store. Electric car charging point. Private car park. No smoking. Please note: There is an unfenced pond in the grounds, 50 yards away. Holidays at Mallard, Wheatacre Hall Barns run from Friday to Friday. Pets allowed at Wheatacre Hall Barns - Mallard. For a better idea of where Wheatacre Hall Barns - Mallard is, you can see Wheatacre Hall Barns - Mallard on the map below. 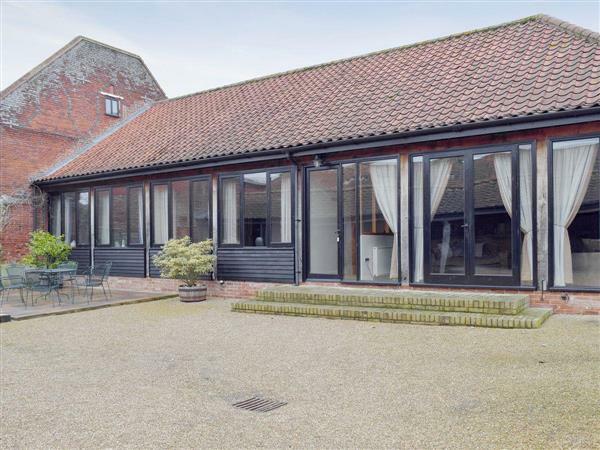 Wheatacre Hall Barns - Mallard is in Norfolk; should you be on the lookout for a special offer, you can find all the special offers in Norfolk. It's always worth checking to see what is on offer at the moment. Do you want to holiday near Wheatacre Hall Barns - Mallard (UKC2655), you can see other cottages within 25 miles of Wheatacre Hall Barns - Mallard; have a look to find your perfect holiday location.